It's Monday, and the Fatherhood #FathersDayFestival is now in full swing. If you want to know what it's all about, have a look at yesterday's post. And don't forget, you've got until the end of today to take advantage of the special 25% discount on Love2Read Books which is exclusive to this site. Today, though, we're moving from brain food to, well... food. Chocolate, to be precise. 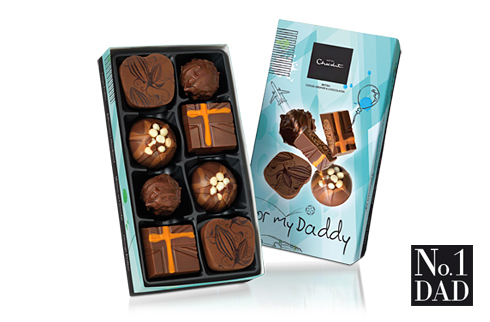 Hotel Chocolat have a fantastic range of presentation packs for all occasions. Whatever your taste in chocolate (or your budget for presents) there'll be something here to suit your needs whether it be a box for someone's birthday or something special for dad this coming Sunday. To win one, all you have to do is write a comment on this post and you're entered. Tweet - using the hashtag #fathersdayfestival - and you get another entry. There's no limit to the number of times your name goes into the hat, but you have to make sure its done my the end of today. Because tomorrow, there'll be something else to give away. And tomorrow, there'll also be a chance to ask some questions of tennis legend Greg Rusedski. No, not about Andy Murray's chances of winning Wimbledon. About being a dad. Yes. Here are the details. So, there you have it. Don't forget to say something interesting (below) to be in with a chance of winning those chocolates. And I'll see you again tomorrow for some more amazing stuff from the Fatherhood Festival.